Lately, I've been working on balance. As someone who occaaaasionally falls on the upper end of the "obsessive" continuum; someone who tends to go-go-go-go all of the time (and has a hard time stopping); and someone who is a bit of a perfectionist of sorts (but not all sorts -- don't look through my kitchen drawers or anything), striking a balance between productivity and sanity / relaxing / recharging isn't always easy or natural for me. I'm done with work for the day? Okay, what's next? Go for a run? Write a blog post? Check something off the wedding to-do list? Vacuum? Create a new recipe? Work on my research? What do I need to do next? There must be something! This is not a 'humble brag' about how much I get done; really, it can be a bit of a sanity-compromising problem. Last month, for instance, I took qualifying exams, which took up most of my free time and had me regularly stressing about how much more I needed to study. The day after I finished -- seriously, the very next day -- I found myself turning towards stressing about how I hadn't finished addressing save-the-dates for the wedding (which was 10 months away!!!). Rather than just sitting back and enjoying getting to hang out with my fiancé after work rather than studying, I was worrying aloud to Ryan about when I'd get the stupid save-the-dates done. He looked at me like I was a bit crazy (can you blame him?) and said, "Taylor. Stop. Why don't you just relax for a few days? You JUST finished quals. Just...relax. You deserve it." He was right. Why couldn't I just enjoy having nothing to do for the time-being? Worrying about save-the-dates was just my way -- without even realizing it -- of inserting a different to-do item into the place of the one that had been accomplished without skipping a beat. But sometimes, we need to skip a beat. 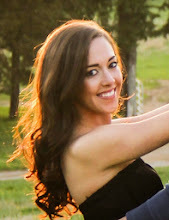 I know that I'll always be a go-go-go type of person, and that's okay -- in fact, it's often a blessing (especially as a grad student...) when I have a lot to do -- but living, and more specifically, living in the moment, is important to me. Even if it means not always getting every little thing done on my to-do list. Our society places a lot of value on just how much you can accomplish and needing to be your best at everything -- being a great worker AND a great partner AND a great friend AND a great parent (or sister or child or fill in the blank), all while cooking, cleaning, and DIYing like Martha Stewart -- and making it look easy and beautiful. I know I'm not the only one that falls into the trap of trying to meet these unrealistic expectations, even if it's at the cost of taking a deep breath and being content in the present moment. I'm working on finding that balance though. In fact, those save-the-dates still haven't been sent. Instead of worrying about it and spending several hours that week working on them, I've just been taking a few minutes every few days or so -- a leisurely rate! -- to work on them. They're about done and ready to be sent with plenty of time to spare. And instead of working through a to-do list, I spent my last 2 summer days off last week reading a book (for pleasure!) by the pool. This... is a big deal for me. Also a big deal? Oven-roasted summer tomatoes and onions atop fettucine tossed in KALE PESTO. This kale pesto is amazing stuff. And honestly, this is not coming from the the biggest kale fanatic you'll ever meet. I eat kale, yes, and pretty regularly too, because it's great for you -- but come on. Kale isn't the most delicious food ever (have you ever tried french fries?). 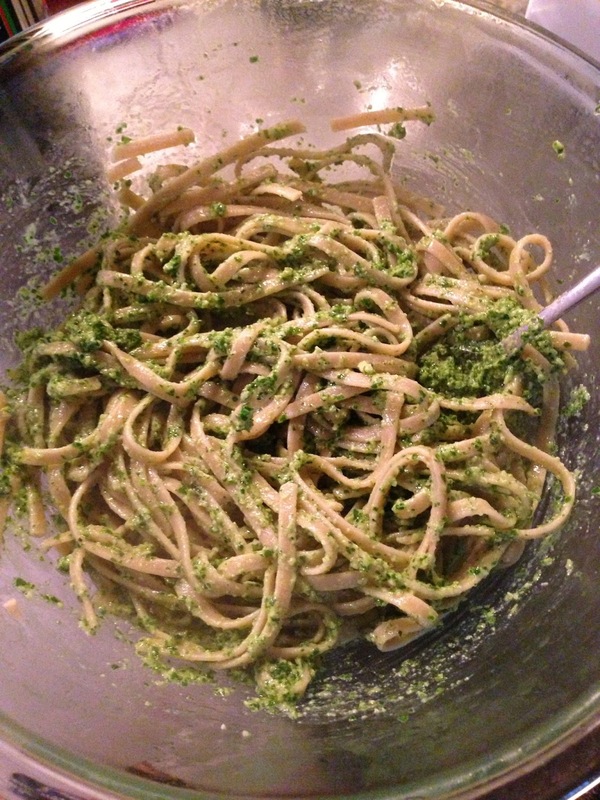 In this pesto though, it totally works. I was surprised at how nicely it came together with the almonds, lemon juice (this part is key), parmesan, garlic, and olive oil to create a creamy, fresh sauce for the pasta. Yummm-o. 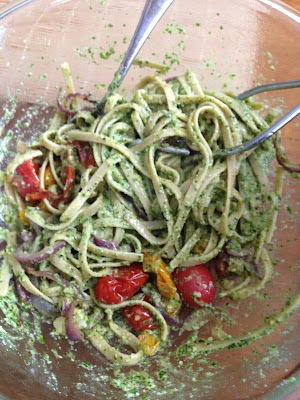 Combine the pesto with al dente whole wheat fettucine and delicious, sweet roasted summer tomatoes and red onions and you have a pretty perfect end-of-summer dinner. Make it while those tomatoes are still perfectly sweet, juicy, and in-season! 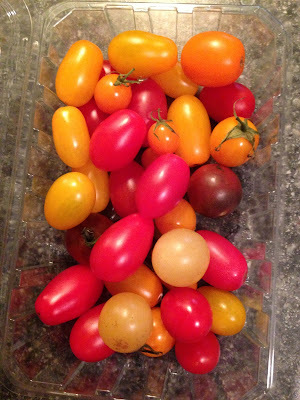 They were perfect for this, but you can use whatever kind of grape or cherry tomatoes you have. And who says you have to use tomatoes? Summer squash and zucchini would also be great in this! Chop up half of a red or white onion as well. 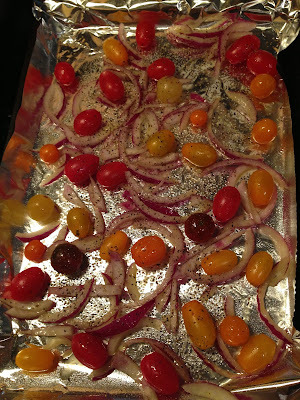 Add the tomatoes and onions to a bowl and toss with 2 tablespoons of extra virgin olive oil. Spread out evenly on a baking pan. Season with sea salt and course black pepper. Roast in a 375 degree oven for 25-30 minutes. While the veggies are cooking, make everything else. Prepare 8 ounces of whole wheat fettucine (or whatever pasta you'd like) according to package directions until al dente, reserving 1/4 cup of cooking liquid before draining. Meanwhile, prepare your kale pesto. 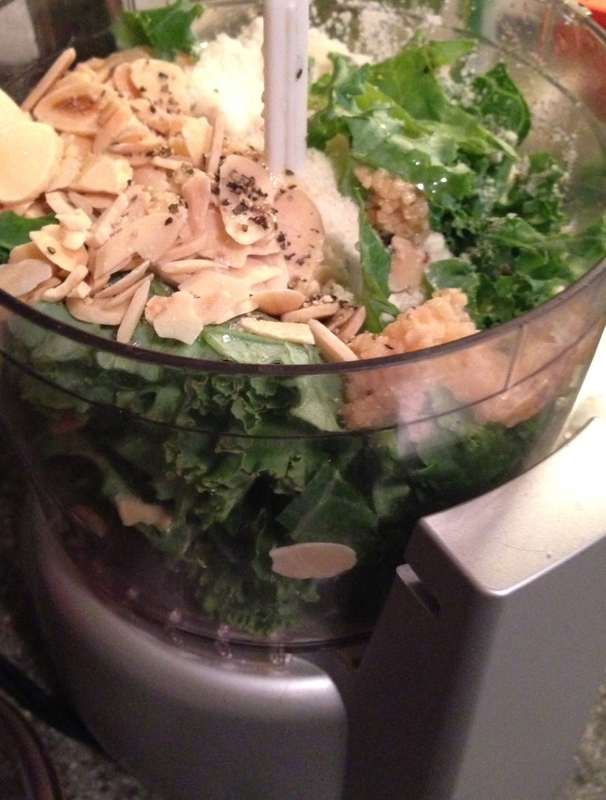 In a food processor, combine about 2 cups of chopped kale (stems removed!) with 1/4 cup of toasted, sliced dry almonds, 1/4 cup of parmesan cheese, 2 cloves of minced garlic, and the juice of 1 lemon. Pulse while slowly pouring in 1/4 cup of olive oil through the top. Scrape from the sides as needed and pulse until smooth. Add sea salt and pepper to taste. When the pasta is done, add it to a large bowl and scoop your pesto in. 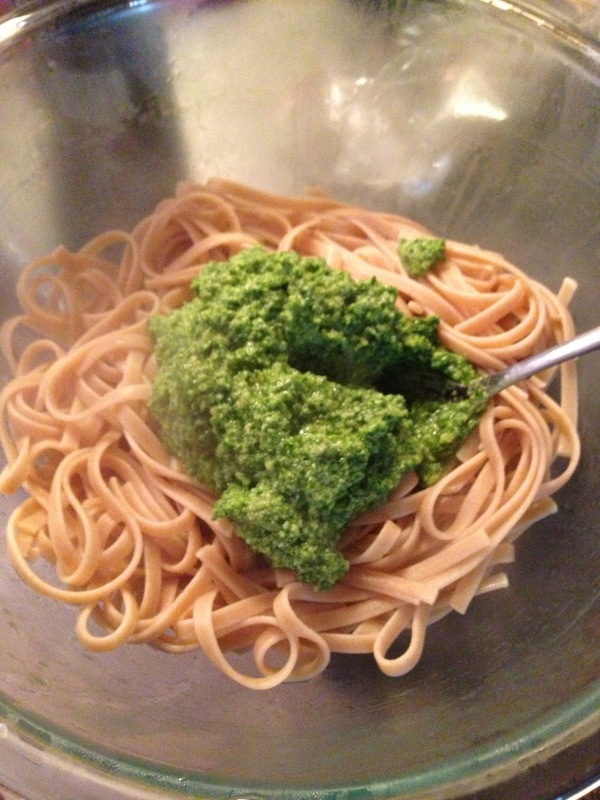 Stir, and slowly whisk in 1/4 cup of your starchy pasta liquid that you reserved until you have a smooth consistency. By this time, your veggies should be about done. Carefully add them to the bowl. So good! Serve it up. -In a bowl, mix tomatoes and onions with 2 tbsp of olive oil. 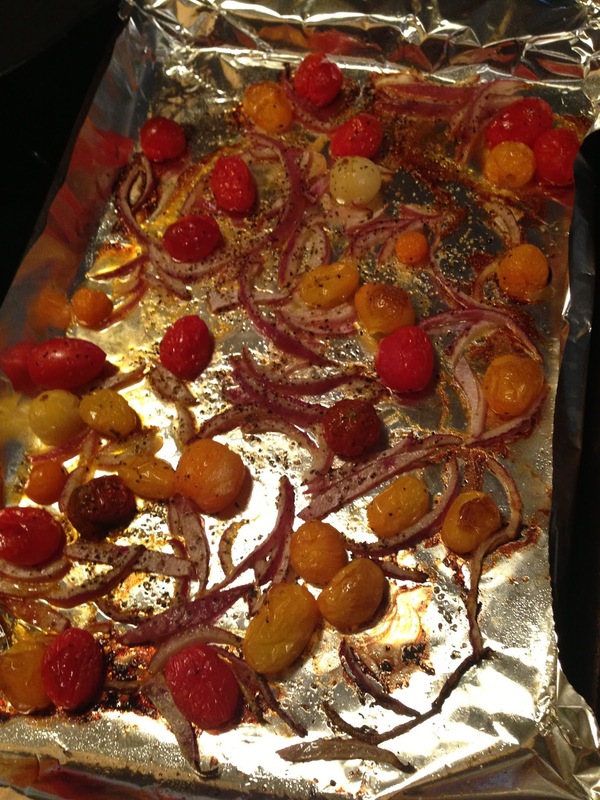 Spread out on a baking sheet, being careful not to over-crowd. Season with sea salt and pepper. Add to oven and roast for 25-30 minutes, or until tomatoes are close to popping. -Meanwhile, prepare your pasta according to package directions until al dente. Before draining, reserve 1/4 cup of the starchy cooking water. -Prepare you kale pesto: In a food processor, add kale, almonds, cheese, garlic, and lemon juice. Pulse while slowly pouring the olive oil into the top. When needed, stop and scrape pesto from the sides and keep mixing until smooth. Add salt and pepper to taste. -When pasta is done, add it to a large bowl. Scoop in the pesto and combine carefully. Slowly pour in the reserved cooking liquid, stirring, until a creamy consistency is reached. -When veggies are done, add them to the pasta. Mix gently. Serve. Yum! 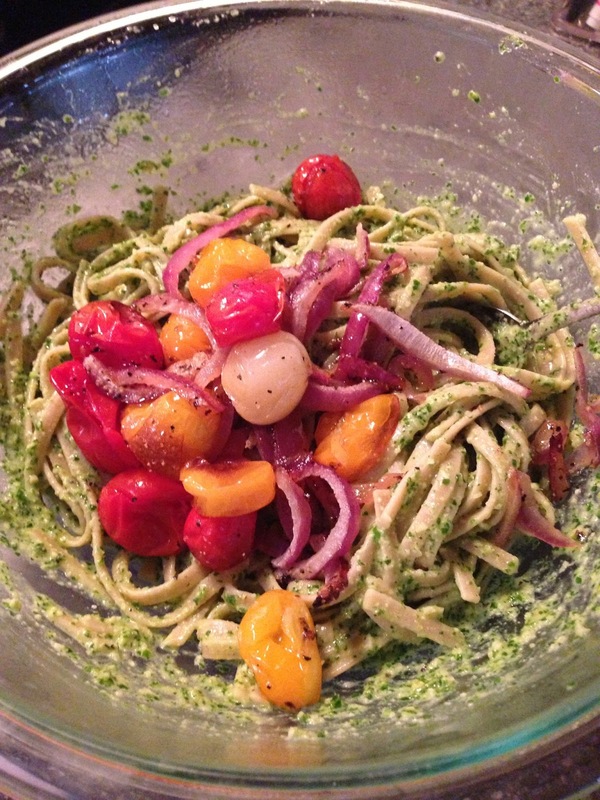 That pesto looks amazing!! I've never heard of using kale before. Also, those veggies look so good too! This looks fabulous. 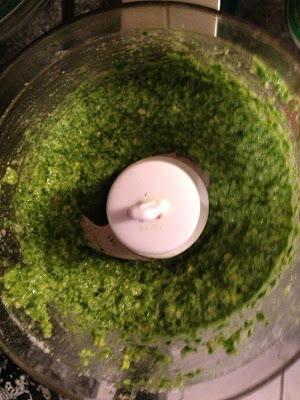 I haven't made my own pesto, but perhaps I should give it a shot! oh, you must! it is too easy not to! Oh wow, that sounds SO delicious! 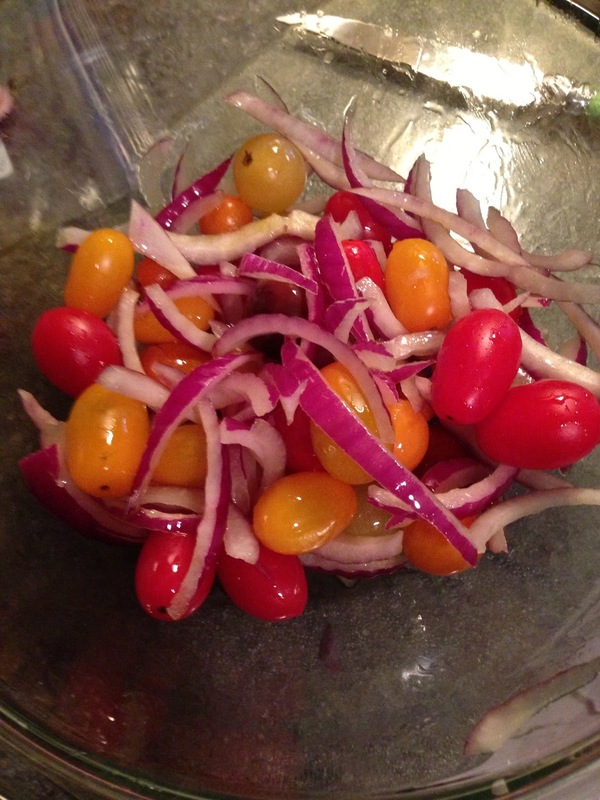 A perfect way to get in some more summer veggies!